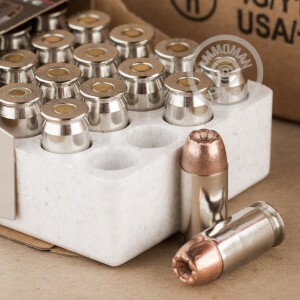 When you are looking for a great self defense round, the 45 ACP is always one of the best options. Due to its consistent use since 1911, it is readily available. In addition, it has been proven in military combat, as well as in law enforcement and civilian use, showing just how reliable and effective it is. With better stopping power than almost any other handgun round, this round is just what you need to stop your attackers for good. Winchester has been around since before the American Civil War, making it one of the oldest companies in America. Having helped shape the nation through its constant high quality manufacturing, you can trust anything that comes from Winchester. 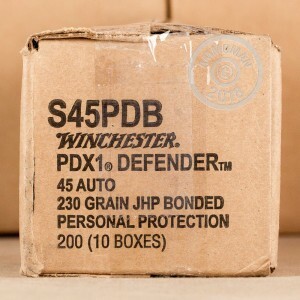 These PDX1 Defender rounds are no different, providing the stopping power and accuracy you need in a self defense round. 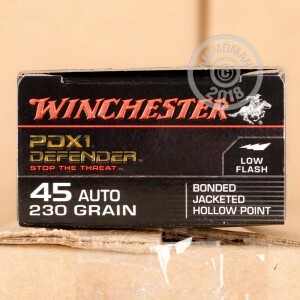 With these 230 grain, jacketed hollow point rounds, you will have no trouble protecting yourself and your family.